Few of our Warblers have a more varied plumage, or are more animated in their motions, than this beautiful little bird. In Louisiana it is met with now and then as early as the middle of March, but there its occurrence appears to be merely accidental, as is indeed the case in Kentucky, Ohio, or any portion of the Middle States, through which a few are to be seen on their passage to more northern regions. In autumn I have seen them in great numbers near the Pocano Mountains, accompanied by their young, proceeding southward, as I thought, along the direction of that range. While in Maine, on my way to Labrador, in the month of May, I observed them to be very abundant by the roads, in the fields, the low woods, and even the orchards and gardens. In fact, so numerous were those interesting birds, that you might have fancied that an army of them had assembled to take possession of the country. Scarce a leaf was yet expanded, large icicles hung along the rocky shores, and I could not but feel surprised at the hardihood of the little adventurers. At night they roosted in numbers in the small evergreen trees, and by day they were to be seen flitting about wherever the sun shone. If the morning was cold, you might catch them with the hand, and several specimens, procured in that manner by children, were brought to me. This happened in the neighbourhood of Eastport. By the end of a fortnight, the greater part of them had pushed farther north. I met them wherever I landed in the neighbouring islands, and along the shores of the Bay of Fundy, as well as in the Straits of Canso, the Magdeleine Isles, and Labrador. I have no doubt that the extraordinary congregation which I saw near Eastport, was caused by the foresight of the tiny travellers, aware that they could not at so early a period proceed farther without imminent danger. Many of these birds, however, remain and breed in the State of Maine, and in the British Provinces. The Black-and-Yellow Warbler has a clear and sweetly modulated song, surpassing that of many other birds of its tribe. It sings in the interior of the low woods, to which it seems at all times to give a decided preference. Its motions are extremely graceful; its tail is constantly spread as it flits along the branches, or even while it is on the ground, to which it frequently betakes itself, and its wings are usually held in a drooping position, so as to display all the beauty of its plumage. It feeds on insects and their larvae. Now and then it may be seen balancing itself in the air, opposite a cluster of leaves, among which it darts to secure its prey; and not unfrequently it emerges a few feet from among the foliage of a tree or bush, to seize a fluttering insect. In catching its prey, it does not produce the clicking sound, caused by the sudden meeting of the mandibles, so remarkable in some other species. The nest, which is placed deep among the branches of low fir trees, is supported by horizontal twigs, and is constructed of moss and lichens, lined with fibrous roots, and a great quantity of feathers. In one, found in Labrador, in the beginning of July, there were five small eggs, rather more elongated than is usual in the genus. They were white, sprinkled with reddish dots near the larger end. The female, on being disturbed, spread out her wings and tail, fluttered along the branches in the agony of despair, lingered trembling about the spot, and returned to the nest while we were only a few yards distant from it. During the first days of August, I saw many of the young following their parents, and perceived that some were already on their way southward. While in the Bay of St. George, Newfoundland, I again saw these birds daily, although they became scarcer the longer we remained in the country. I also traced their retrograde flight into Nova Scotia, but on landing in the United States lost sight of them. This beautiful Warbler is, according to Dr. RICHARDSON, a common bird on the banks of the Saskatchewan river, where it enlivens the thickets of young spruce trees and willows with its agreeable notes. It was not observed by Mr. TOWNSEND on the Rocky Mountains or along the Columbia river. As I proceeded towards the Texas, in the beginning of April, I found it in considerable numbers on its way toward the United States. The eggs measure five-eighths and three-fourths in length, four-eighths and a half in breadth; in some instances the ground-colour is slightly tinged with very pale yellow. BLACK-AND-YELLOW WARBLER, Sylvia magnolia, Wils. Amer. Orn., vol. iii.p. 63. Adult. SYLVIA MACULOSA, Bonap. Syn., p. 78. BLACK-AND-YELLOW WARBLER, Sylvia maculosa, Nutt. Man., vol. i. p. 370. 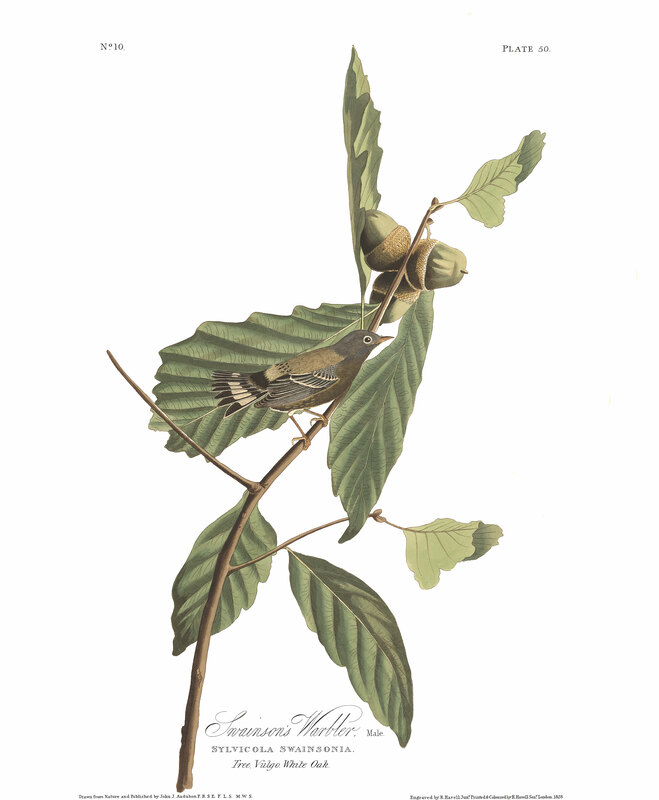 SYLVICOLA MACULOSA, Yellow-rump Warbler, F. Bor. Amer., vol. ii. p. 213. BLACK-AND-YELLOW WARBLER, Sylvia maculosa, Aud. Orn. Biog., vol. ii.p. 145, Adult; vol. i. p. 260, Young; vol. v. p. 458. Wings of moderate length, the outer four quills nearly equal, the second and third longest and equal, the fourth longer than the first; tail almost even. Upper part of head and hind neck ash-grey; eye-lids, and a band over the eye, white; part of forehead, loral space, and a broad band down the side of the neck, with the fore part of the back, and upper tail-coverts, deep black; lower parts and rump bright yellow; the lower part of the throat, the breast and sides, spotted with black; wings and tail-feathers brownish-black, edged with grey; two white bands on the wing; all the tail-feathers, except the middle two, with a large patch of white on the inner web, at about two-thirds of their length. Young yellowish-grey above, with the head light grey, the rump yellow; lower parts of a duller yellow, with only faint dusky streaks on the sides. From Texas northward. Very abundant. Migratory. RUBUS ODORATUS, Willd., Sp. Pl., vol. ii. p. 1085. Pursch, Fl. Amer. Sept., vol. i. p. 348.--ICOSANDRIA POLYGYNIA, Linn. --ROSACEAE, Juss. This species of rasp has the stems hispid; the leaves three or five-lobed, acute; the flowers in lateral and terminal corymbs, with divaricate stalks and appendiculate calyces. It is abundant in the Middle and Eastern, but rare in the Southern and Western Districts. It forms part of the rich undergrowth of our woods, and also grows in old fields with other species of the genus. The flowers are rose-coloured and showy, but destitute of odour, and the fruit is delicious and highly fragrant, from which circumstance the species derives its name.